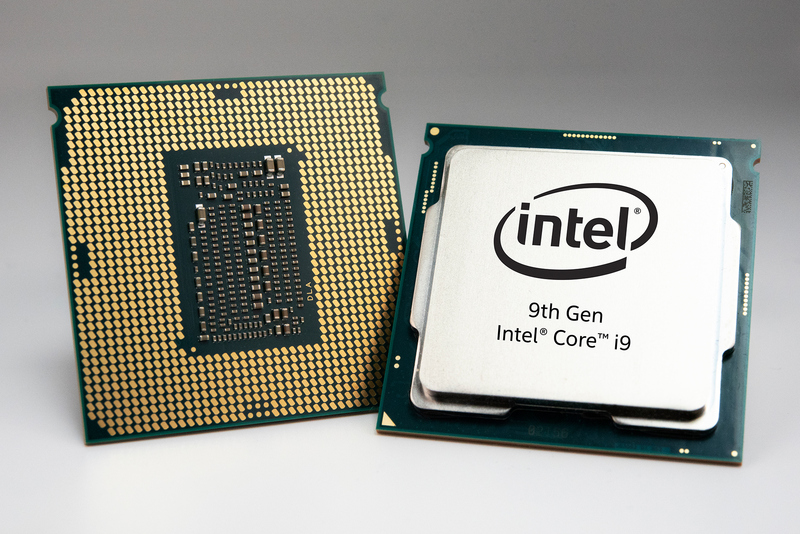 So far Intel's 9th Gen Core on desktop only features three models aimed at the higher end of the spectrum. The launch of the lineup consisting of these three products with unlocked multiplier does not yet have any “locked” parts aimed at mainstream PCs, although we are expecting them at some point. The question is one of when they will come. As it appears, from listings of numerous companies in the supply chain, Intel is finally gearing up to expand its Coffee Lake Refresh family with new models. The products in question are the eight-core Core i9-9900KF and Core i7-9700KF, as well as the six-core Core i5-9600KF and Core i5-9400F. These devices have been listed by retailers Data-Systems.Fi, Newegg, and distributor Synnex (see screenshots below). According to Intel’s existing nomenclature, the CPUs with model numbers ending with F, like 9400F lack integrated graphics, so we suspect the new processors will primarily target higher-end systems featuring discrete graphics. This will mark the first time that Intel has launched integrated graphics-free processors in its mainstream family at the high-end for many, many years. The higher-end Core i9-9900KF, Core i7-9700KF, and Core i5-9600KF look set to run at the same frequencies and feature the same cache configurations as their non-F colleagues. As for the Core i5-9400F, this six-core chip runs at 2.9/4.1 GHz, well below the clocks of the i5-9600K, but will have a TDP of 65 W. All of these parts, according to the listings, will be able to be used in current 300-series motherboards. *These CPUs has not been launched officially, specifications have not been confirmed. Intel has not officially confirmed existence of these CPUs, or mentioned plans to release them. 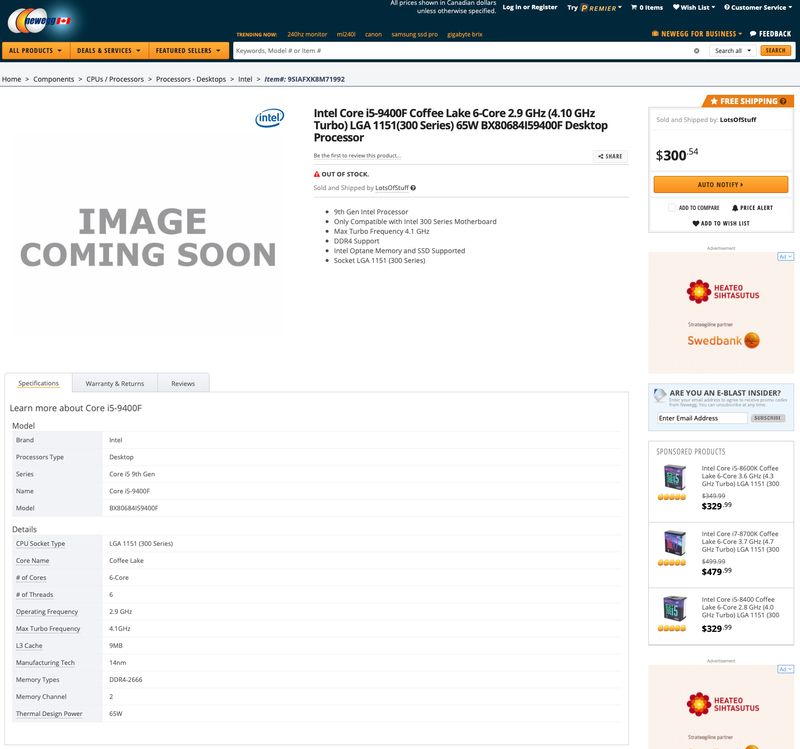 In the meantime, listing of the Core i5-9600KF by Newegg and the Core i5-9400F by Synnex Thailand indicates that their launch is likely imminent. Avid readers will remember that CES 2019 is taking place in early January, so the question is whether Intel starts to sell these CPUs more or less quietly ahead of CES, or if it will announce them publicly at the trade show. In any case, if Intel proceeds with the launch (or rather when), it may broaden availability of its latest eight-core and six-core CPUs both in terms of physical availability and in terms of pricing (i.e., the i9-9900KF will hopefully cost less than the i9-9900K). In the meantime, one has to remember that Intel has high demand issues in general, so the effect of the launch is something that remains to be seen. It could be that the company will not focus on the Pentium/Celeron parts this time around, but instead make these higher-performing (and higher margin) offerings more regular.